Random House, New York, 2011. 226 pages. The more I read Laurel Snyder’s work, the more I like what she does! This is a wonderfully written story of a girl dealing with her parents’ divorce. She finds a magic bread box that will grant wishes — as long as the item wished for can fit in the bread box. But of course wanting her parents to get back together doesn’t fit in a bread box. Anyway, this book doesn’t give generalizations about divorce. It doesn’t preach. But it shows how it feels to one kid in this situation. And you can’t help but notice that her parents aren’t paying a lot of attention to how she feels. A few days later, on Halloween, her mom takes her two-year-old brother Lew trick-or-treating, and Dad stays home with Rebecca, which is a first. But she doesn’t think much else has changed, except for her dad sleeping on the couch. Then her mom packs them up in the middle of the week and takes them from Baltimore to Atlanta, where Rebecca’s Gran lives. She doesn’t get to say good-by to her friends, and leaving her dad is awful. When they get to Atlanta, Rebecca learns that her mom has gotten a temporary job and enrolled Rebecca in school. She doesn’t whine about it, but she does get mad. Readers can easily see for themselves that her mom isn’t thinking a whole lot about what this means for Rebecca. When she goes to the attic to sulk, she finds a collection of bread boxes, and one is bright and shiny. She takes it down to her room and feeling homesick for Baltimore, she wishes there were gulls in Atlanta. And then she hears the cry of a gull — in the bread box! Naturally (after shooing the two seagulls out the window), she tries out what the bread box can do. It can give her money; it can give her food; it can’t give her things that don’t exist, like a real magic wand, or things that don’t fit in a bread box like wishing she were home. So Rebecca has to adjust to a new school, where right away everyone calls her Becky. She figures she can be a different person here, someone cool. She has the bread box, after all. She can wish for little gifts for her new friends. She can wish for an ipod and listen to music. She can wish for a little TV and watch shows under the covers. But magic always has a catch. And when Rebecca finds out what’s really going on with the bread box, it seems like she’s in a worse fix than ever. This isn’t a problem novel. This isn’t trying to teach anyone how to deal with divorce. But it does tell Rebecca’s story in a tough situation that a lot of kids also have to face. Rebecca has magic to help, but that doesn’t solve the real problems at all. Now, don’t get me wrong. The author does not present this as the solution to the problem. Like real life, the blow up creates more new problems, including hurting her mom and getting her mom angry. But I wanted it to be said, and I think it does remind her mom that she needs to consider her daughter more than she has been doing. Rebecca also gets new problems when she tries to solve the problems she inadvertently created by using the bread box. Anyway, I liked it that someone wrote a book from the perspective of a kid caught up in the middle of her parents’ divorce. The feelings ring true. The story is compelling. And it does make you wonder: If you had a magic bread box, what would you wish for? Source: This review is based on an Advance Review Copy I picked up at ALA Annual Conference. 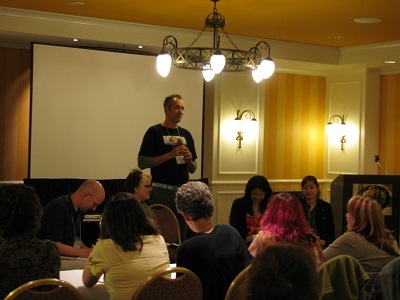 At KidLitCon in Seattle a couple weekends ago, there was a session on reviewing critically, and lots of discussion about how a critical review is not necessarily a negative review. But then a statement about reviewing critically on the Cybils site, and a comment about book recommendations vs. critical book reviews in an excellent wrap-up article had me feeling a little bit defensive. I do only review books I like. But I maintain that by no means disqualifies me from calling them “reviews.” Yes, I’m writing recommendations, but I try to tell the reader why I liked the book. The word that came to mind was “flavor.” I want to give my readers enough information for them to figure out if they will like the book I’m reviewing. I want to give them the flavor of the book, so they know if that’s what they are in the mood for. This is why I so often include quotations from the books I review. Then my readers can “hear” the voice the author is using and see if it appeals to them. I want people to get a feel for the book. As a librarian, my mantra is “every book for its reader.” I don’t like to write negative reviews, since I don’t want to imply judgment of the person who enjoys that sort of book. Now, I do think that every book I review on my site has some level of excellence. (And believe it or not, despite my volume of reviews, there are some books that I read but don’t review because I don’t really recommend them.) But I want to give you enough information about the book so you can decide if it is right for you at this particular time. Mind you, judging for an award is quite different. I enjoy the Heavy Medal blog very much, which discusses potential Newbery books, and love debating in the comments the strengths and weaknesses of the books they mention. That’s a different kind of critical thinking. After all, choosing a book for an award requires different information and different discussion than telling a friend this is a good book and I think you might enjoy it; here’s what it’s like. To me, it’s the difference between telling someone the flavor of a cookie or critically evaluating the skill with which the cookie was made. Both are a lot of fun, and I very much hope I’ll get to be on an award committee some day. But on this blog, I’m trying to let you know all the wonderful flavors that are out there. 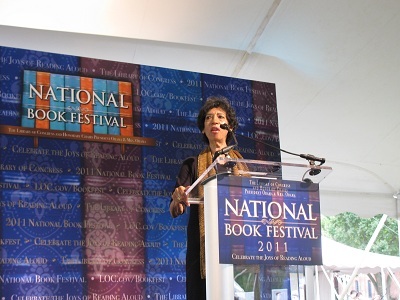 This year, I had to work on the Saturday of the National Book Festival, but that worked out nicely, because this year they decided to extend the Festival to Saturday and Sunday. 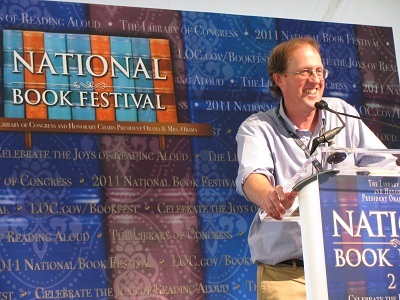 I was happy to attend Sunday, since that was the day Gary Schmidt would be speaking, author of the book I’m rooting for to win the Newbery Medal, Okay for Now. Since events started at 1:00 on Sunday, instead of at 10:00, as on Saturday, the event ended up being less tiring for me this year. That was a good thing, since exactly two months after my stroke, I’m still not quite up to the same energy level I used to have. So, right after church, I headed downtown. I did arrive on time for most of Susan Cooper’s speech. 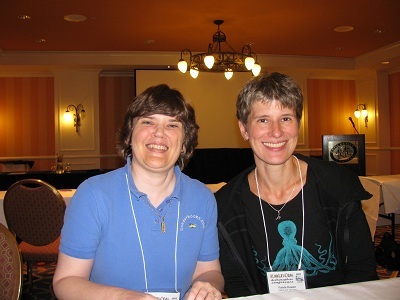 Susan Cooper is the amazing author of the Dark Is Rising series and many others, like the Boggart books and a wonderful book about writing. She talked about the magic of reading, and how a book is the ultimate door to the imagination. She talked about the magical connection that’s made between readers and writers. And she had the whole audience shut our eyes and she led us through the reading of a poem to see a unicorn. It was a lovely talk, and I was thrilled to hear her. 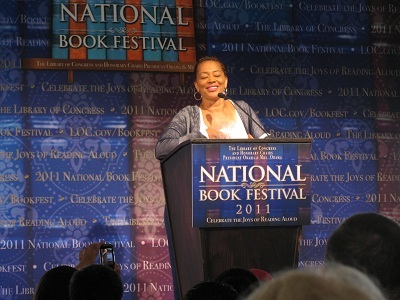 Next, I went to hear Terry McMillan. 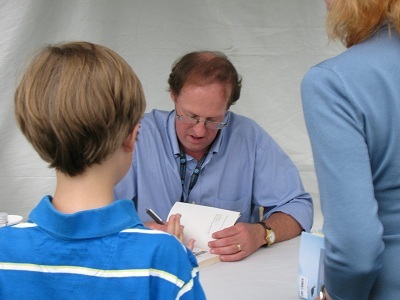 Then I waited in line to get two copies of Okay For Now signed by Gary Schmidt. 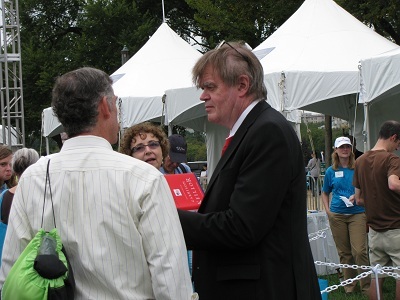 While waiting in line, I got a good view of Garrison Keillor, also signing autographs. Then my plan was to go to the Teen tent and sit there for the rest of the afternoon. First up, I got to hear the end of Kadir Nelson’s talk. He told the entertaining story of how he’d dress up like the historical characters he was going to paint if he couldn’t find a model. Even the women. He says, however, that those pictures have been burned. She said that she writes to tell the different story. And that she’s a listener first. She gave us the background of some of her books, like The Dark Thirty, in a most entertaining way. 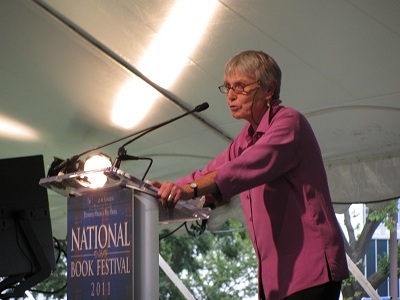 Then she talked about writing her first science fiction trilogy by taking the news and doing some “What-Iffing.” She started with a news article about cloning bacteria that would eat oil spills and went on to think up an entire future society where human clones are created to do certain jobs. She made clone codes based on the old slave codes of the past. Don’t teach the clones to read. Don’t let the clones gather in groups of more than three or four. She made these books sound very fascinating. Finally, it was time to hear Gary Schmidt, the author I’d particularly wanted to hear. My phone ran out of batteries just as his talk started, so I wasn’t able to Live Tweet his speech, as I had the others. However, before it ran out, I was able to connect with Sara Lewis Holmes and sit with her, which added to the fun. Gary Schmidt was, no surprise, a wonderfully funny speaker. He told about the real things from his life that he put into his books — like having to be in Mrs. Baker’s class every Wednesday afternoon and scraping gum off desks until the principal intervened. He said that his books answer one question: In times like these, how does a child turn his face to adulthood? Particularly in a culture where we don’t want children to grow up? For the humor, he takes real things, and heightens them. For him, it’s all about voice. He has to hear who’s talking. Why does he do it? In a world where we throw kids away, books are companions. He told a story about visiting a group of teens in a high-security prison. Books can reach kids like that. Books provide friends. Someone asked if his faith affects his writing, and he said that it does. He believes that grace is given to everyone. That was why he gave the father at the end of Okay for Now a small moment of grace. He’s gotten all kinds of flak about that! But he believes there’s hope for everyone. Afterward, my friend Sara talked about how Gary Schmidt’s books are like Shakespeare — they take the ordinary and make you believe in the extraordinary. She said that with both, you shouldn’t ask if this is realistic. They take you to a place where you believe the extraordinary can happen. 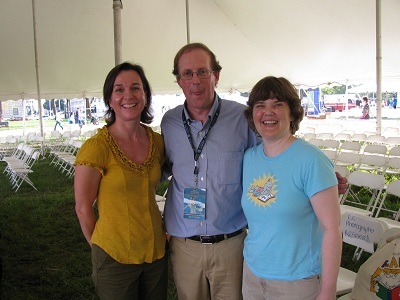 We were talking so much, all the people clamoring around Gary Schmidt had left, so she told him about the Shakespeare Camp she’d just been to, and then I got a picture with him and Sara. So it ended up being a lovely afternoon. 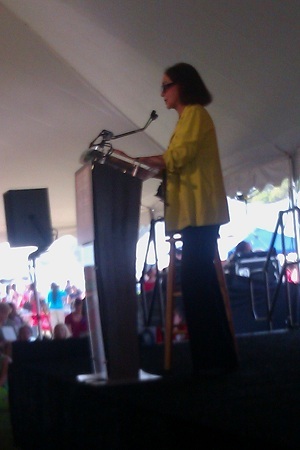 I’d been feeling quite tired and fuzzy-headed in the morning, but National Book Festival perked me right up! It did help that I stayed sitting the last few hours. But it was a lovely time to stop and hear people talk about how wonderful books are. 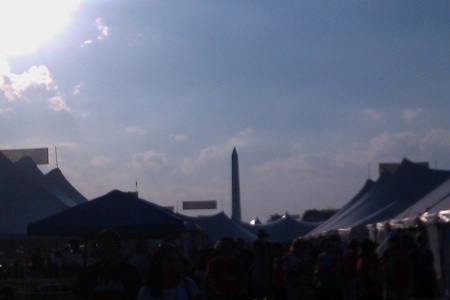 I’ve lived in Virginia for five years now, and I’ve been to the National Book Festival four times. The first two years weren’t as good an experience as the next two, so I thought I’d share some tips. 1. Purchase books you want signed ahead of time! I just ordered two copies of Okay for Now, by Gary Schmidt, one for me and one for a gift. This is what made me think of writing this post. This year, I have to work on the Saturday of the Festival (September 24), but this year they are extending the festival to two days, so I can attend on Sunday, which is when Gary Schmidt is speaking. The reason for this tip? The tent where they sell books is a crowded, awful place. You will have a hard time looking at books and a long line to pay for them. They will be sold at full price. But if you are like me, you will see books you want and purchase them on a whim, only to discover that you can’t make it to the long line when that author is getting books signed. Much better: If you really want to get a book signed, purchase it ahead of time and bring it to the festival. 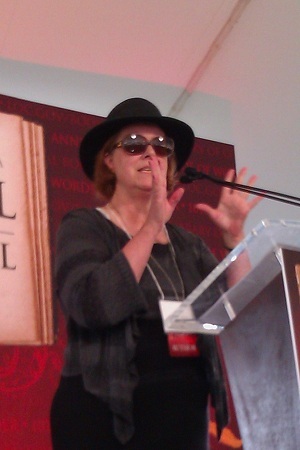 Last year, I didn’t get any books signed, and enjoyed the Festival tremendously, with more time to listen to authors. 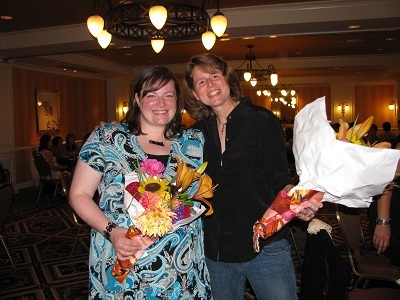 The year before, I got a book signed by Shannon Hale, and was unutterably thrilled when she knew who I was (from my website) as soon as I told her my name. The Library of Congress Festival website has the schedule of when each author will speak and when they will get books signed. Getting books signed will require waiting in line, probably starting before the scheduled time. If you just stroll around the festival, looking for what’s interesting, you’ll have trouble getting into a tent and you’ll miss out. And might get rained on. 3. Plan to get a good seat in a tent — and stay there! 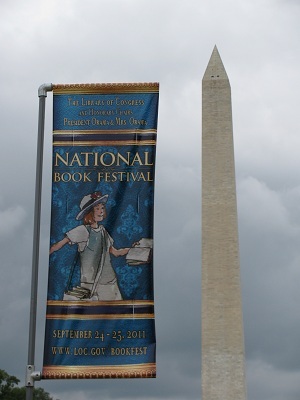 Most years that I’ve gone to the National Book Festival, it’s been raining. Last year, instead it was blazing hot. Either way, you’ll be much much more comfortable in a tent. 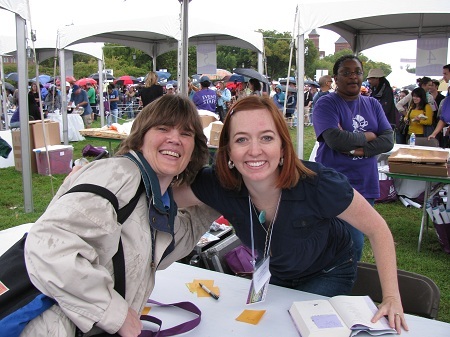 However, the tents do not have enough seats for everyone who wants to hear these incredible authors speak. 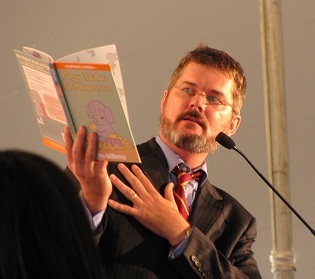 So a couple years ago, when I very much wanted to hear Mo Willems speak, I planned to get in the tent to hear the speaker before him. Sure enough, you can usually find a seat up close when one speaker finishes, if you’re right there to grab a seat from departing people. I discovered two years ago that if there are two speakers you want to hear who are speaking in the same tent, you will be treated to some fabulous speakers you might not have heard otherwise if you just STAY IN YOUR SEAT! Seats are gold — try not to leave once you snag one! So those are my three big tips. I’ll see if I get new ones this year, when I’m only going to the half-day events on Sunday. 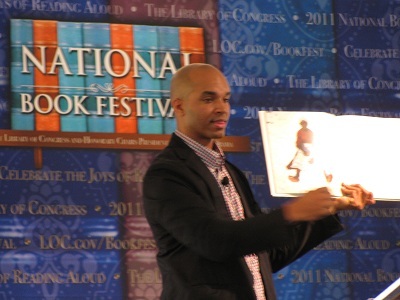 Here is my post about National Book Festival from ’09, but it doesn’t look like I posted any last year, probably because I didn’t bring my camera and only took pictures on my phone. 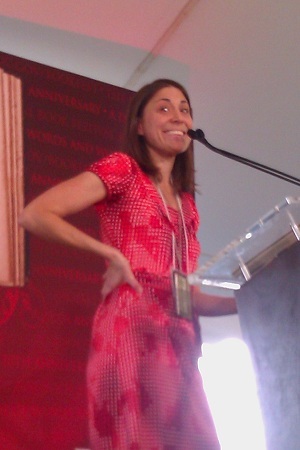 But I heard some great authors, just by sitting in a couple tents all day (in the blazing heat). I’ve got to share! 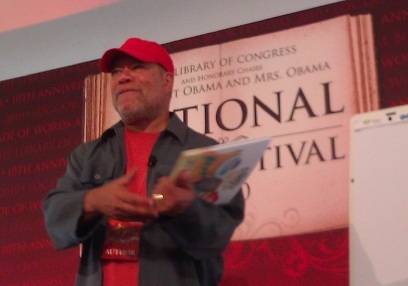 And finally, Jerry Pinkney, now a Caldecott Medalist. 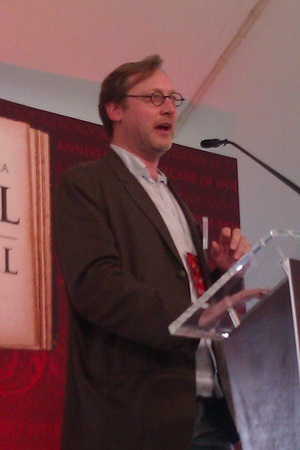 I’d discovered what a great speaker he is the year before, at the National Book Festival, and have now heard him speak three times, once receiving his well-deserved medal. I love it when he takes questions from the audience, because he does so well with the children who ask questions. Oh, and one final tip! 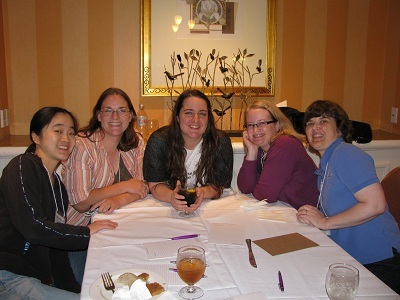 Last year, some local book bloggers got together and had dinner in DC after the Festival. That’s a super way to finish it off. Anyone going to the Festival on Sunday? Leave a message in the comments or contact me on Twitter at @Sonderbooks! It’s a great time to get together with other book lovers. A. K. Peters, Ltd., Natick, Massachusetts, 2011. When I first heard of this book, I was delighted, and rushed to order my own copy. I was even more delighted when I read the book. I requested that the library system order it as well. This book would have been absolutely perfect when my sons were young and exploring numbers. I hope I get a chance to share it with a child. I love it so much because of my experience making my prime factorization sweater. I chose a color for each prime number, then made a chart of all the natural numbers up to 100, showing their prime factorization with colors. I loved all the patterns that resulted. Richard Evan Schwartz uses a similar idea, but adds a lot of creativity: For each prime number, he creates a monster! Then composite numbers are shown with the monsters from their prime factorization interacting together. It’s a lot of fun to look through the pictures and see the way he’s worked in the monsters. He’s also got an arrangement of dots on each page that demonstrates more about the number and the way it’s composed. He says he created the monsters to explain prime numbers and factoring to his daughter, and I would love to share this book with a child. You can look at it again and again. “For the composite numbers, we factor the number into primes and then draw a scene that involves the monsters that match those primes. This book would also be great support for a child learning the multiplication tables. If you visualize monsters, they’ll be much easier to remember! Most of all, I love the way this book showcases the playful, creative, and beautiful side of mathematics. 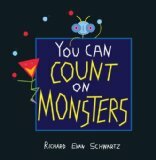 You can count on Monsters to show you just how much fun math can be! Source: This review is based on my own copy of the book. However, I haven’t posted a whole lot of mathematical content. Probably more mathematically-oriented books than most book blogs, but definitely not the majority of my posts. But that may be about to change! Because my attention was directed to a post called The 50 Best Twitter Feeds for Math Geeks. It’s on the blog Best Colleges Online. If you are a fellow Math Nut, you will want to check out these Feeds! !t Books (HarperCollins), 2011. 205 pages. This book is amazing, and like no book I’ve ever read before. It’s a biography, a record of love and scientific discovery, but it’s also a work of art. There are striking images on almost every page. The artist used cyanotype printing, which she explains in a note at the back. The story told in the book is also fascinating. She tells how Marie met Pierre Curie and their progress in science together. She tells about Pierre Curie’s tragic death and Marie’s life afterward and continued distinguished work. 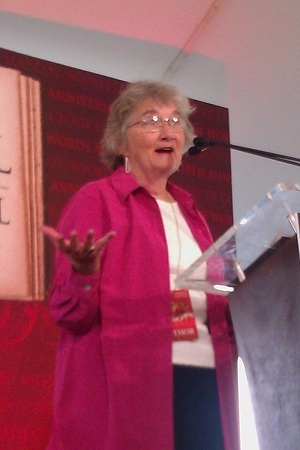 Throughout the story, she provides images and clips and stories about things that happened with radioactivity later, such as Hiroshima, Three Mile Island, and Chernobyl. I had no idea how radium was touted and marvelled over when it was first developed. The Curies did not patent their findings, but others were not so scrupulous. “A fictitious Dr. Alfred Curie was hatched to shill Tho-Radia face cream. Radium-laced toothpaste, condoms, suppositories, chocolates, pillows, bath salts, and cigarettes were marketed as bestowers of longevity, virility, and an all-over salubrious flush. The story is fascinating and surprising. The images are stunning and memorable. This book is definitely not for children, but if it were, I would think this was a sure winner of the Caldecott Medal for the most distinguished picture book providing a visual experience. Spend a little time gazing at the pages of this book, and you will be amazed. Spend a little time reading the pages of this book, and you will be intrigued. You are currently browsing the Sonderbooks blog archives for September, 2011.